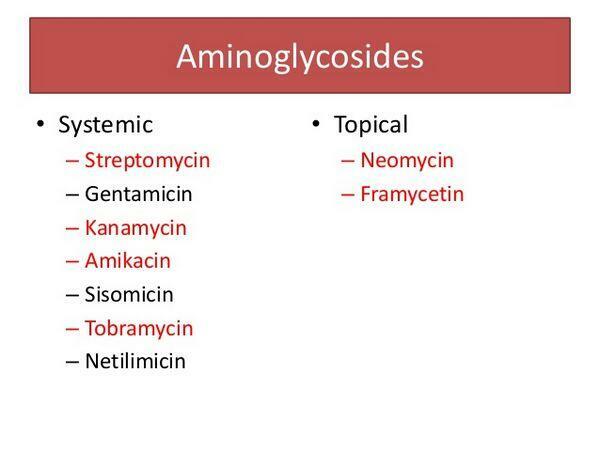 Aminoglycosides are the preferred agents for treating serious infections caused by aerobic gram-negative bacilli. Aminoglycosides play only a minor role in the treatment of community-acquired pneumonia; their use is typically limited to hospitalized patients with severe or complicated community-acquired pneumonia in which gram-negative infections (particularly P. aeruginosa) are suspected. In these situations, physicians may prescribe aminoglycosides in combination with a cephalosporin or carbapenem. Gentamicin is a prototypical aminoglycoside. Other commonly used agents in this class include the generics tobramycin and amikacin, but these agents will not be discussed further. 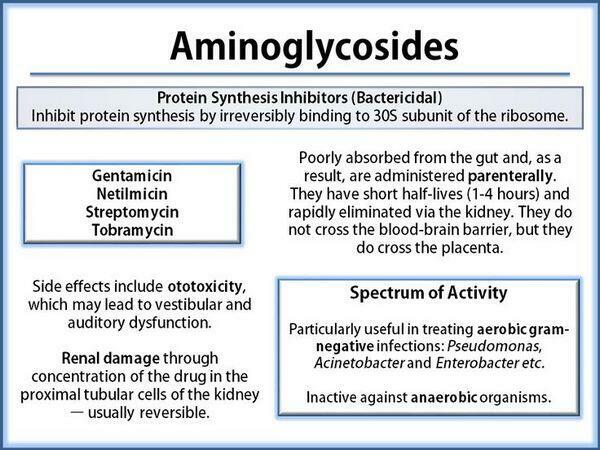 All aminoglycosides are potentially nephrotoxic and ototoxic (which manifests as auditory or vestibular dysfunction). These concentration-dependent toxicities are reversible with reductions in dosage. Aminoglycosides impair protein synthesis by binding to receptors on the 30S subunit of the bacterial ribosome. Binding to the 30S sub-unit interferes with the initiation of polypeptide formation, causes the production of defective proteins (misreading of the messenger RNA template), and disrupts ribosome function. The effect of aminoglycosides is bactericidal (concentration-dependent). However, the precise mechanisms by which aminoglycosides exert their bactericidal effect are not entirely understood. Gentamicin (Schering-Plough's Garamycin, generics) has been available since 1966 to treat infections caused by aerobic gram-negative bacilli. A synergistic bactericidal effect against streptococci occurs when gentamicin or other aminoglycosides are used in combination with a cell-wall-synthesis inhibitor (e.g., cephalosporins, glycopeptides). Gentamicin is produced by Micromonospora purpurea and binds to the bacterial 30S ribosomal subunit, causing translational errors that result in cell death. No quality clinical trials are available that assess gentamicin's efficacy and safety in community-acquired pneumonia. Like other aminoglycosides, gentamicin is associated with kidney toxicity that requires serum monitoring if the agent is administered for several days or used in patients with renal dysfunction. Side effects also include vestibular dysfunction and hearing loss.